This week there were two Life Book lessons. 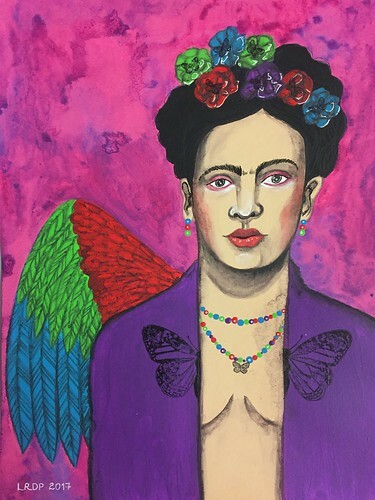 I only had time available to tackle one of them so I opted to respond to the lesson taken by Tamara Laporte which involved creating a mixed media portrait of Frida Kahlo. I am absolutely not a portraitist. I cannot capture people’s likenesses accurately at all. The idea of even attempting to portray someone as immediately recognisable as Frida Kahlo was pretty intimidating but that was precisely why I decided to dive in and give it a try: growth through challenge. Frida Kahlo seems to be pretty zeitgeisty at the moment. I am seeing lots of homages and merchandise here and there. I confess I am not a massive fan of Kahlo’s art. I appreciate it and recognise its worth but it just doesn’t speak to me in the same way that the work of other artists does. I actually find her more inspirational as a person than I do as an artist. As such, I didn’t have an immediate idea of how to portray her. I flicked through some photographs of her and scribbled down some ideas and sketches – the hair style, the daring clothing that emphasised her female sexuality, the use of bold colours. All of those found their way into my finished piece. Laporte had incorporated a parrot into her portrait of Kahlo and I took that idea and turned it into a parrot wing. I had also thought I would add some big jungle leaf shapes into the background, a feature I noted in several of Kahlo’s self-portrait, but in the end I decided that it would all get a bit too busy and let it be. I am not sure how I feel about this piece yet. I think I need to give it some time before I make a judgement about its successes and flaws. My husband, who has a minimal interest in the history of art, immediately recognised this as being a portrait of Frida Kahlo, however, so at least I must have somewhat met the challenge of painting a passable likeness. A likeness and, I think, something of her spirit. Thanks, Ellie. I’m glad it’s recognizably Frida and that you can see something of my style in it.